Wow! 2007 Built Shelby Township Ranch. 4 Bedrooms; 3 on Entry and 1 on Lower Level with Egress Window. Master Suite with Vaulted Ceiling and 9x5 Walk-in Closet and Private Full Bath. Hardwood Floors through Great Room, Kitchen, Eating Area, Foyer, Hall, and Master Bedroom. Open Great Room with Cathedral Ceiling and Gas Fireplace. 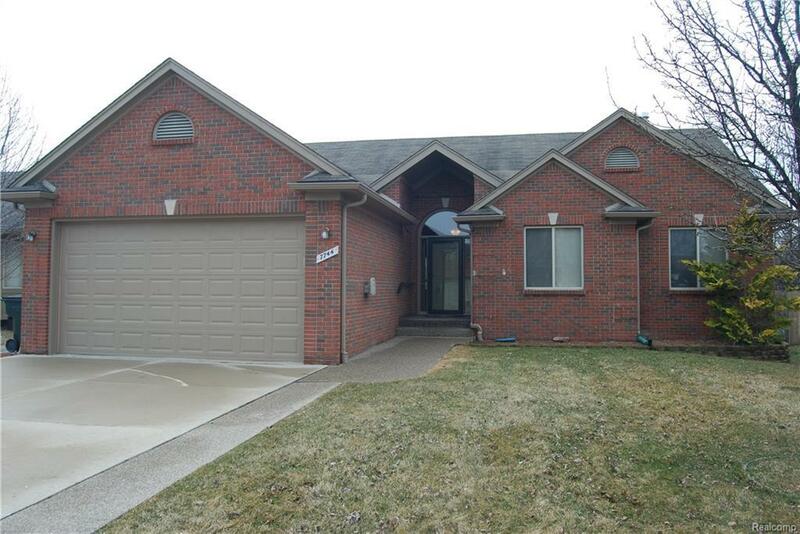 Well-built and Low-Maintenance mostly Brick and Vinyl home with Full Finished Basement. LaFata Cabinets. Open Kitchen with Plenty of Storage; Built-in pantry cabinet, additional Pantry, and Separate Walk-in Pantry/Storage. Garage has lots of power, Wall-mounted Gas Furnace, Air Filtration, and Ramp (removed by seller if buyer desires). Shed has Power. No Homeowners Association. Fenced Yard. Beautiful Stamped Concrete walk-way leads from Driveway to full width Stamped Concrete Patio. Convenient access: WALK to Restaurants, Groceries, and Shopping.